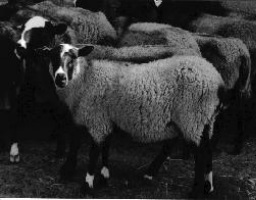 Romanov Sheep originated in Russia during the 18th century. They were imported into North America (Canada) in 1980. They were introduced from Canada into the United States in 1986. Romanovs are an exceptional breed due to their superior reproductive performance, as they tend to average a 300+ percent lambing rate on mature ewes that have been managed properly. The ewes are early maturing and will be ready to breed back within a few months after lambing. They are good mothers and milkers and usually are able to care for their lambs without assistance. The lambs are born with a black guard hair which dries quickly on cold winter nights. At approximately 4 weeks of age they begin growing grey wool and by maturity will be mostly grey with black hair fibers throughout. The wool is used in carpets or wall hangings and felts exceptionally well. 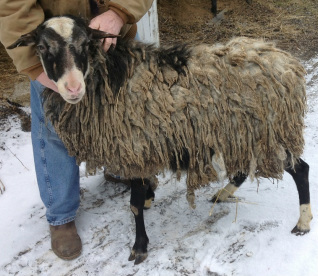 When crossed on domestic sheep, they lose their characteristic black guard hair. 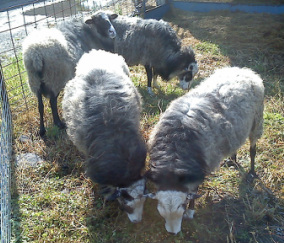 Average mature ewes weigh between 100-150 pounds and rams weigh between 150-180 pounds. 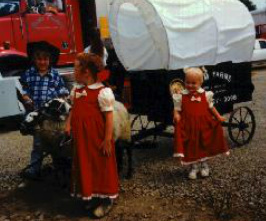 Romanov sheep excel in crossbreeding programs, where their out-of-season breeding and multiple births will be passed on to the ½ and even ¼ blood Romanov crosses, who will produce twins and triplets for the commercial stockman. We have retired and no longer have any Romanovs for sale.